What are Rise and Drop? How Do I Measure for Rise and Drop? 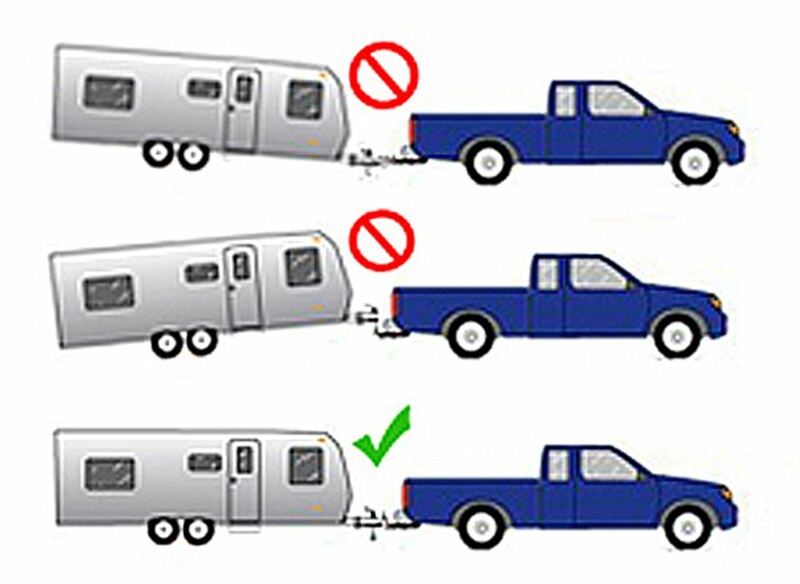 What If I Tow Multiple Trailers? How Do I Choose an Adjustable Ball Mount? For safe and comfortable towing, your trailer should always be as level as possible. A level trailer handles well, promotes even tire wear, and minimizes strain on both the trailer and tow vehicle. However, with the many different tow vehicles and trailers out there, it's rare that any vehicle and trailer line up perfectly for towing. This is why ball mounts are made in a variety of sizes and come with what's known as rise and drop—to compensate for the height difference between your trailer and vehicle and allow for safe, level towing. Rise is the distance from the top of the shank to the top of the ball platform when the ball mount is oriented for greater coupler height. Drop is the distance from the top of the shank to the top of the ball platform when the ball mount is oriented for lower coupler height. 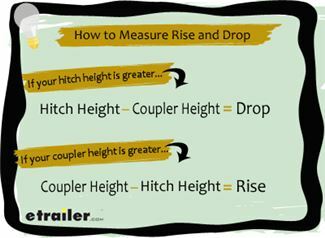 To choose a ball mount with the correct rise and drop, you'll first need to take two measurements: your hitch height (Measurement A) and coupler height (Measurement B). The difference between them will be your rise or drop. With the tow vehicle parked on level ground, measure from the ground to the top of your hitch receiver opening. 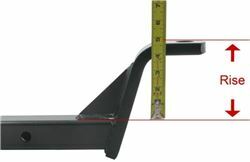 With the trailer level, measure from the ground to the bottom of the coupler. 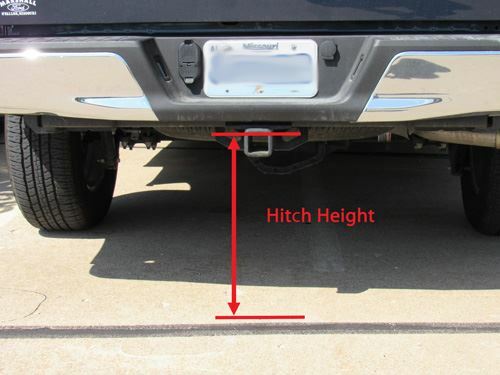 Determine which has a greater height—your hitch or coupler—and find the difference between the two measurements. If your hitch height is greater, use a ball mount with a drop. If your coupler height is greater, use a ball mount with a rise. Select a ball mount with a drop (C) or rise (D) measurement that is closest to the difference between your hitch and coupler heights. For instance, if your hitch height is 15 inches and your coupler height is 10 inches, you'll need a ball mount with a 5-inch drop. 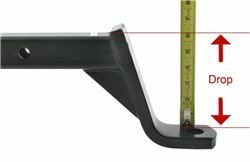 Measurement A (15") - Measurement B (10") = C (5" Drop). If your hitch height is 12 inches and your coupler height is 13 inches, you'll need a ball mount with a 1-inch rise. Measurement B (13") - Measurement A (12") = D (1" Rise). If you need to tow multiple trailers, you should consider an adjustable ball mount. While fixed ball mounts have a set rise and drop, the rise and drop on adjustable ball mounts can be altered to accommodate different coupler heights. Adjustable models can save you the trouble and expense of using a separate ball mount for each trailer. Simply slide the ball mount platform up or down the shank and secure it in place with the locking pin to achieve the necessary rise or drop. To choose the best adjustable ball mount for your towing needs, first you'll need to determine the tongue weight of the heaviest trailer you want to tow. 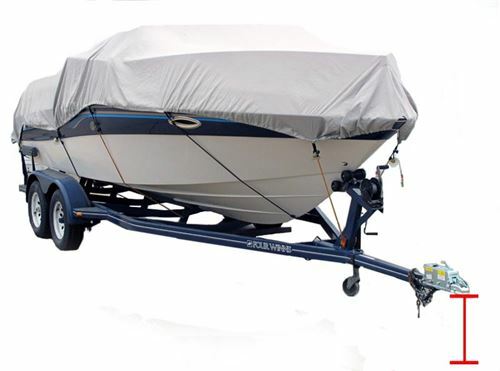 Make sure your adjustable ball mount has the weight capacity to support the loaded weight of the trailer. Also make sure the ball mount you choose has the correct size shank to fit your hitch's receiver (for instance, use a 2-inch ball mount with a 2-inch hitch receiver). Next, determine the tallest rise and deepest drop you'll need using the guidelines above—this will be the range you'll need in your ball mount. Finally, determine which hitch ball diameter you will need. 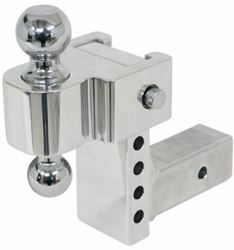 Adjustable ball mounts usually come with at least one ball, and most come with two or three balls of different sizes for towing different trailers.